Murder Over Medium (Jade Blackwell Mystery Series) is on virtual book tour and stops at Readeropolis today with an author interview featuring Gilian Baker. Don't forget to enter for a chance to win the giveaway and follow the book tour (for other dates see the bottom of the post). My books are written for all cozy mystery readers, though I did have a particular group in mind when I first came up with the concept of a blogger-as-amateur-sleuth. The idea for the characters and plot came to me when I was a struggling, burnt-out blogger. My college-age daughter, also a writer, talked me into joining NaNoWriMo 2015 with her, even though I had no time for fun and games. This was the first time I’d dipped my toes into the waters of fiction writing, and I loved it! It was such a catharsis! I got to touch upon some of the hardships we “solopreneurs” deal with on a daily basis while designing a whodunit! Before deciding to publish that first book, I cut around 40,000 words from the NaNo manuscript. Too. Much. Catharsis. Online entrepreneurs work too much and can feel isolated. I wanted to give them a way to step away from their to-do lists and laugh. 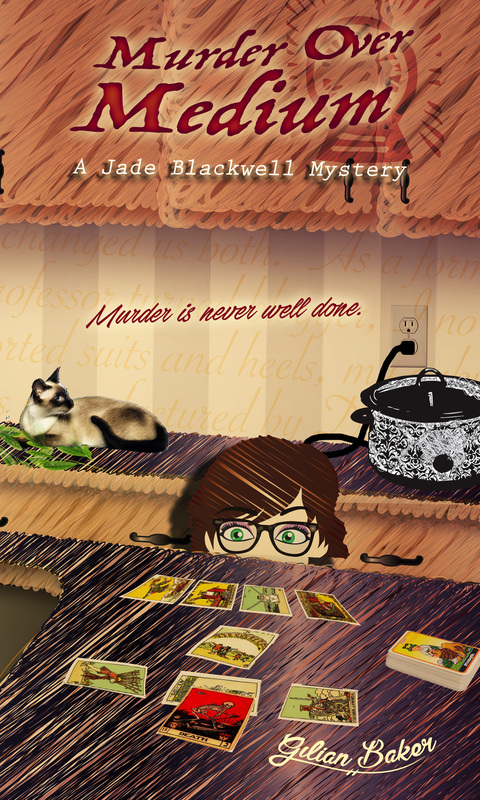 And so, the Jade Blackwell Cozy Mystery Series was born. I hope the books are a fun read for everyone, especially for those bloggers and freelancers who need to take more breaks and relax. I must give full credit to my husband for the title Murder Over Medium. I couldn’t come up with anything I loved. Time was running out—I needed to get the cover concept to my graphic designer, but still didn’t have a title. One day my hubby and I were sitting on the front porch and since he knew the plot, I asked him to throw out some title ideas. Murder Over Medium was the first thing he came up with. I immediately loved it! The play on words is perfect because one of Jade’s, my protagonist, flaws is her lack of cooking skills. Of course, I love Jade, but that’s too easy. So, I’d have to say Phyllis Buckley. She’s an 80-something woman with lots of energy and is more curious than Jade. (Well, maybe.) When we first meet her, she’s wearing a housecoat, tube socks and shower shoes. Her hair is a gray, fuzzy halo that looks like she entered a wind tunnel after her shower. She never worries about what anyone else thinks—she’s past all that. Phyllis does Pilates, loves social media, has a new boyfriend, and of course helps Jade figure out clues. My fans love her! She’s such a fun character to write. In fact, I rarely have to stop and think about what Phyllis would say or do. She came to me in a flash, fully formed, which in itself is miraculous. I can see her in my mind’s eye easier than any other character. She and Jade met in Book 1 Blogging is Murder, and I immediately knew I wanted to continue the character. She’s a pip. You never know what she’s going to say or do next. Even I’m surprised sometimes! I almost changed the ending. I love the current ending, don’t get me wrong, but after I’d sent the manuscript off to my editor, a different ending popped into my head. I vacillated for a while about whether to change it. But in the end, I decided to write the alternative ending and give it away to my readers. I can’t wait to hear back from them about which one they prefer. The link for the free download is in the back of the book so your readers can easily access it. I must admit that even though the book pokes fun at the metaphysical, I’m really into that stuff. Have been for many years—certainly before it came into vogue! 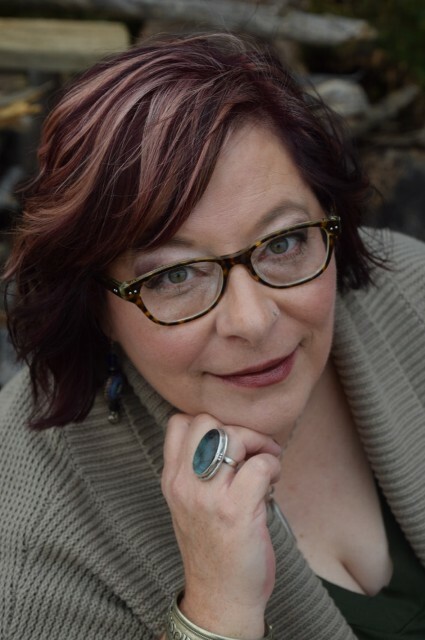 Maybe that’s why I was able to write it the way I did…because I’ve been called all kinds of names for believing in spirit guides, crystal energy and whatnot. And like Gwendolyn Hexby, the psychic medium in the book, I use tarot cards as the tool to seek guidance. Along those same lines, I am a Reiki Master-Teacher. Reiki is an ancient Japanese form of energy work that is passed down from student to teacher. It’s helpful in healing on all levels—physical, mental, emotional and energetic. I’ve already started Book 4 in the Jade Blackwell series, and have ideas for several plot lines/settings that I’m eager to write about. I plan on continuing to write this series until it no longer thrills me. I also have some ideas for other series brewing. At least one will be set in a totally different setting and time. I’m not prepared to say more than that about them right now though. If you’ve always wanted to write, do it. There’s been no better time in the history of publishing to make it happen. The trick is making it a priority. Just like anything else, you have to make time for it if it’s important to you. When I took the plunge to publish my first book, I decided I’d go through the process once, and if I loved it, I keep going. If not, I’d pat myself on the back for giving it a go and then move on. It’s hard work, but it’s worth it. If you want to be an author, you’re going to have to treat it like a job. Schedule writing time and don’t let anything keep you from planting your bum in that chair to write. Mayor, just wanted to drop you a quick note of thanks for hosting me on my latest book tour! It's an honor to be here!